...part of Spark Arena, on the South side of our Main Plaza, and is a flexible space with a number of uses. 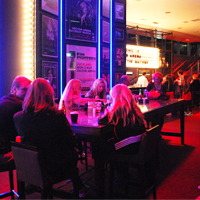 Open prior to most events, the Tuning Fork is the perfect place to meet for a pre-show drink or to relax over a meal once you've arrived for your event. The Tuning Fork menu varies from event to event, and includes a range of items from snacks to pizzas to light meals (you can see a sample menu here.) There's also full bar service, with smoking allowed at our outside tables. 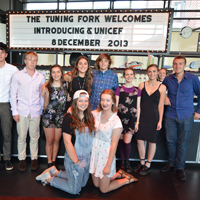 The Tuning Fork was fitted out with soundproofing, drapes, PA and lights during 2013, with our first proper gig being 2 sold out nights of jazz standards performed by Molly Ringwald. Since then, the bookings have been building, and we now have a great programme of coming events. Head over to the Tuning Fork's own website for info on upcoming events. If you are a local promoter or band manager, please contact Steve Wheadon to enquire about performing here. The Tuning Fork is available to hire for private showcases, parties, product launches, meetings, and smaller scale balls and dinners. Please contact vip@sparkarena.co.nz to get started planning your private event.